I’m pleased to announce that my 2013 wildlife calendar is now available to preview and pre-order from my website. If you place an order before October you will secure a signed copy for the special rate of just £10 and you will receive your calendar(s) as soon as they are off the printing press. This wall calendar features a blend of 14 new, award-winning and popular wildlife images from around the world. The selection includes lions, meerkats, grizzly bears, elephants, humpback whales, wild dogs, bald eagles and peregrine falcons, amongst others. Every calendar page also features information about a species and how each photograph was taken. The calendar is A4 in size when closed and two full pages are visible when hung on the wall. This is a pre-order special offer for signed copies at just £10 while the calendar is at print. Donations from every sale will be donated to further the essential conservation efforts of the Endangered Wildlife Trust. I am really proud and excited to announce that my acclaimed African wild dog book Underdogs is now available to buy in the shops across South Africa. This 156-page coffee-table conservation book focuses on the Southern African population of this endangered carnivore and so South Africa has always been a major market for the title. 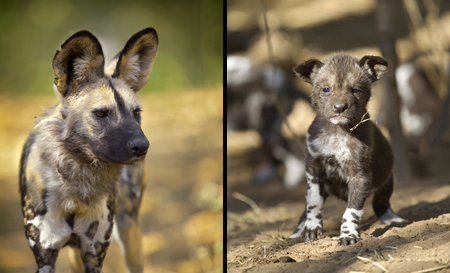 African wild dogs suffered in 2011 with many packs being hit hard by poaching and persecution. 2012 has seen high profile support for the conservation of this iconic and charismatic carnivore in South Africa. I simply hope that Underdogs can add to people’s understanding of these creatures and play at least a small role in securing their future in South Africa and beyond. Download a provisional list of outlets selling Underdogs (this list will be updated wherever possible). You can see a gallery of photographs and read more about Underdogs on my website, where it is also possible to order a signed copy of the book. In 2009 I was lucky enough to spend time with a pack of African wild dogs and their one month old pups at their den site deep in the Limpopo river forest. The time spent with them still rates as my favourite wildlife experience and the photographs that I took feature heavily in my new African wild dog book Underdogs. This is why it was so hard to receive the news that the pack was found dead from deliberate poisoning recently. Andrei Snyman of Botswana’s Northern Tuli Predator Project reported that the pack had been found dead at their new den site agonsingly soon after the alpha female had given birth to a new litter of pups. To make matters worse, a male leopard, African wild cat and African hawk eagle were also found poisoned after feeding on two carcasses laced with Temic – a highly toxic poison. Two men have been arrested in connection with the incident and claim that they lost livestock to the animals (although it cannot be said which species was responsible for the predation). The incident spells the end of the line (for now) for the Tuli wild dog pack – once a much celebrated success story following their high profile cross-border translocation from South Africa. 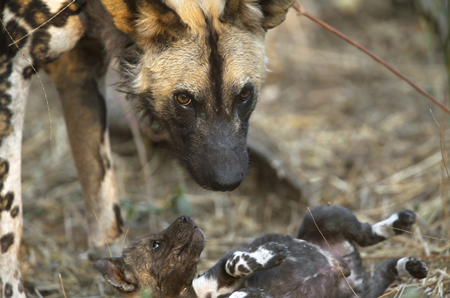 The incident also threatens the viable future of the wild dog in the Limpopo Valley following on from the removal of the Venetia Limpopo pack just across the river in South Africa in 2010. 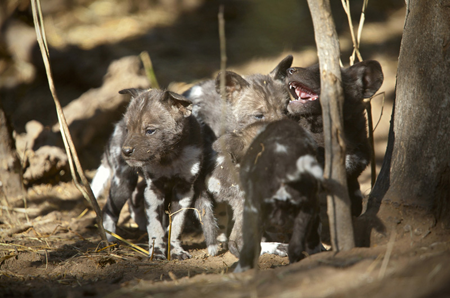 With wild dog numbers so low and populations so sparsely distributed, sub-populations like the Limpopo Valley population are essential for the future of the species as young wild dogs can disperse to form new packs and keep the gene pool healthy. This news came to me just days before my African wild dog book Underdogs arrives in South Africa. The story of the Tuli pack features in the book and I am really proud to be supporting wild dog conservation through sales so please do visit my website to order your signed copy. Every copy sold will make a real difference on the ground to those few wild dogs remaining and to the people dedicating their lives to protecting these charismatic yet marginalised predators. Don’t miss out on the chance to get a signed copy of my new African wild dog book Underdogs at a special pre-publication rate. With 23% off the retail price, you can order online via my main website at conservationphotojournalism.com and donations from sales will be made towards valuable conservation work aimed to secure a future for this endangered species. You can also see selected pages from the book on my website. Underdogs will soon be available through selected booksellers at the full retail price.